Very little seems to be known about William Hope Hodgson’s war service. The basic facts are listed in the chronology in Ian Bell. He joined the Officer Training Corps of the University of London in 1915, and was commissioned in the 171st Battery of the Royal Field Artillery in July 1915. 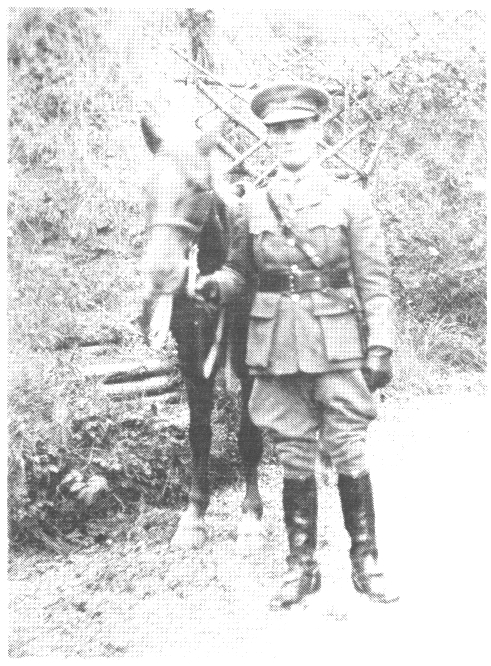 He was thrown from his horse during training in June 1916, and the injuries, above all to his head, were so severe that he was discharged from the army. He returned to Borth, where his wife and family were. In 1917, having recovered, he re-enlisted, and was recommissioned into the Royal Field Artillery as a temporary 2nd lieutenant. In October 1917 he saw his first action at the Front. He was wounded in a German attack on 10 April 1918, and spent a brief period in hospital. On 17 April he volunteered for the post of Forward Observing Officer (who would direct the fire of his battery), and on 19 April he was killed by a German shell. What remained of him were buried on the spot, the following day, on Mount Kemmel in Belgium. If I live and come somehow out of this (and certainly, please God, I shall and hope to) what a book I shall write if my old “ability” with the pen has not forsaken me (quoted in Frank, 51). See Ian Bell, ed., William Hope Hodgson: Voyages and Visions (Oxford: I. Bell and Sons, 1987), and Jane Frank, ed. The Wandering Soul: Glimpses of a Life. A Compendium of Rare and Unpublished Works by William Hope Hodgson (Hornsea, E. Yorks and Leyburn, N. Yorks: PS Publishing and Tartarus, 2005). The Oxford Dictionary of National Biography entry is written by the science fiction and fantasy scholar Brian Stableford.